Emmy came to New Hope on November 16, 2018, New Hope was contacted by Canine Action Project. Emmy had been hit by a car and needed to be seen by a vet immediately. Emmy was seen at the Western College of Veterinary Medicine and her x-ray results showed an avulsion fracture of her right carpus (wrist). Her left forelimb had fractures of her 2, 3, 4, and 5 metacarpal bones. 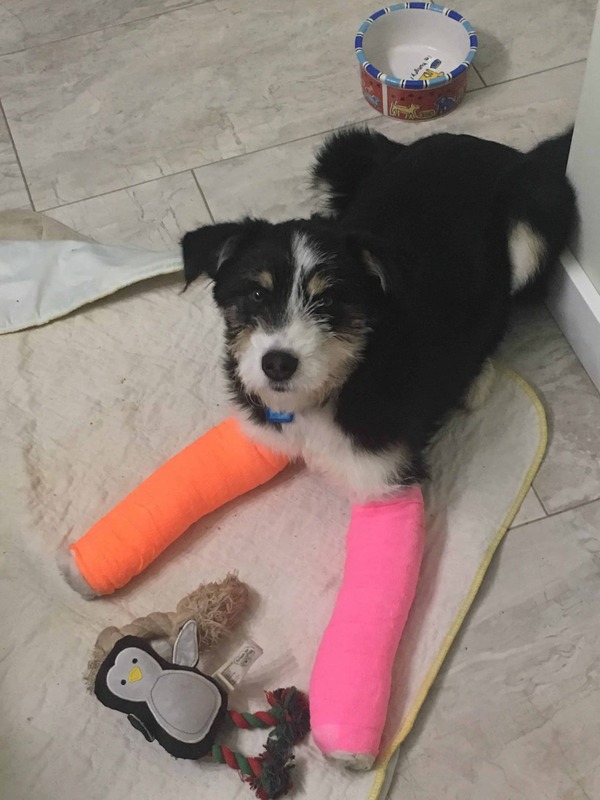 Emmy’s fractured metacarpals were surgically repaired with metal pins and her right carpus was splinted, it did not require surgical repair. Emmy will require bandage changes for a few weeks as well as some daily exercises for 8 weeks. If you would like to help with Emmy’s care, please consider donating to our Guardian of Hope fund. This fund goes directly towards Emmy’s care as well as other dogs that go through our Guardian of Hope program.